Hi Friends, I’m still moving a little slower than normal – thanks for hanging in there with me! Today I’m getting into all the details of organizing our main bathroom. It’s been on my mind for a while because when we moved in we pretty much just dropped all the bathroom stuff in the drawers and called it a day. Well, now it’s four months later and the bathroom was starting to drive me crazy. The stuff we used frequently would get left on the countertop because the drawers were too cluttered and messy to make finding things easy. We’re so lucky that our bathroom is pretty big; we have plenty of countertop space, double sinks, and two big drawers. So, I know there had to be a way to use all that space. But, as you can see from all these before pictures we totally weren’t doing that. The before pictures are completely un-styled. This is literally what our bathroom has looked like almost everyday since we moved in. Luckily I love organizing (strange as it sounds) so I was really excited to finally have some time to work on this. When I jump into a new organization project I like to start by figuring out what the problems are/what I want out of the space. It makes it easier to find a solution that might actually work. So, here’s an overview of our biggest problems in there. 1. Crazy messy drawers and cabinets that were making it too difficult to put things away, meaning we’d end up leaving everything on the countertop. I’m firmly in the “nothing-on-the-counter-tops” camp and I really don’t like clutter up there. 2. Xan’s stuff. Xan has the right sink so he doesn’t have any drawers next to him. I wanted to find a solution for him to be able to access his stuff easily while also keeping it out of sight. He’s firmly planted in the “don’t-care-if-there’s-stuff-on-the-counter-tops” camp and while he’ll happily put things away to humor me, it has to be super easy for him. Otherwise he forgets to do it, because it’s something that doesn’t bother him. 3. Storage. While the bathroom is really spacious there’s not much storage. I like to keep a healthy supply of our regular toiletries on hand so we never run out or have to do that 10:00pm grocery trip because we don’t have any more toothpaste. Plus, I’d like to keep some extra towels and washcloths in here. Eventually I want to get a cabinet of some sort to put in the hallway to store all that stuff and free up the vanity for only the things we use frequently. But, until then we need a place to keep extra bars of soap, razor blade replacements, extra toilet paper and all those other things. So, I started by going to Target and buying several different drawer organizers. I brought them back home to see which worked best in my space and for several reasons I liked these best. I used these large ones, the small ones, and mediums that I can’t find on Target’s website. The biggest factor for me was that they’re shallow. This means everything is really easy to see and get to. If something is hard to get out you’re less likely to put it away knowing you’re just going to have to dig it out again later in the day. Plus, with a shallow container you don’t have anything that you can’t see. This keeps you from accidentally buying more of something you already have or completely forgetting about something, never using it and then finding it when it’s too old to use… (I’m looking at you, nail polish.) The other thing I really like about these particular drawer dividers is that they have a non-slip liner so I can stand things up right to keep them from leaking and they don’t fall over when I open or close the drawers. Plus, I like that I can pull one out, put it on the counter while I’m using the contents and easily put the whole thing back. That’s what I’ve been doing with my make-up. I pull out the container while I’m putting it on and then when I’m done I just stick it right back in the drawer. 1. Group everything in the drawers based on when or how you use them. There are the obvious combinations like putting all your make-up in one container or all your brushes together. But, then I also made a container of the stuff I use every single day. Like my contacts, glasses, moisturizer and deodorant. And while those things don’t seem to have anything in common, this makes it really easy to put everything back right after I use it. I also ended up grouping all my hot tools in a container, my nail polishes in another (I love that they can stand up right – no leaking! ), and all hair accessories (pony tail holders, bobby pins, clips, headbands, etc). I didn’t put my hairdryer in a container. Because of it’s shape the container would have to have been so big it would have taken up nearly a whole drawer. That’s an instance where it actually would have been a waste of space rather than helpful. Instead I stuck it in some free space in the bottom drawer. 2. Make the things you use the most the easiest to access. I put my most frequently used items in the top drawer and the things I use less frequently in the bottom drawer. And those everyday items I mentioned above? I put those at the very front of the top drawer. It’s only been organized for a couple days so I may end up doing some rearranging as I learn what feels more natural. 3. Allow room for more. The cabinet is where most of the back stock and things that we don’t use frequently live. Like medicines, band aids, extra bars of soap, and our travel toiletry bags. For the medicines, Band-Aids, and extras I used plastic Tupperware bins. I got them a little bigger than necessary to allow for us to accumulate more things. We always want to find things that fit our stuff just perfectly – it’s so satisfying, right? But, the problem is that as soon as you get something new your system is ruined because everything no longer fits perfectly. So, in areas where you know you’ll accumulate more things this is a great strategy. With medicines, for example, I knew we’d buy more of them in the future. We didn’t really bring any with us and we’ve only been here a few months so it’s inevitable that we’ll be buying some things here and there. My make-up on the other hand is something that I’m probably not adding to and so I used a container that fit it pretty perfectly. 4. Take things out of their boxes if you can. We had a ton of band aids for some reasons, so I took almost all of them out of their boxes and was able to consolidate them into a much more efficient Tupperware that fits in easily with the others. It’s a much cleaner look and now I don’t have to look through 5 different Band-Aid boxes trying to find the right size. I also stuck the Neosporin and medical tape in there, almost like a little first aid kit. 5. Think about how you use things. Under the sinks is where we decided to put Xan’s every day stuff. I got him one of the long organizers so everything is in a nice even layer and easy to grab. My inclination was to put it right next to the wall of the cabinet, but instead I put it where the two cabinets come together so he can get to it without fully opening them. It felt weird to do because it’s just floating in the middle, but it makes so much more sense. Our cabinet doors are actually quite long and I think it would be enough of a pain to open them all the way that he wouldn’t do it. It sounds silly, but these are the things you have to notice and think about when you’re organizing. Because EASY is the key to being able to keep it up. Like way easier than you even think. I promise! 6. Utilize every area you can. I have a few canisters on the counter and in the cubbies. I put things like q-tips, cotton balls, and even my extra razor blades in those. Basically taking advantage of every opportunity for storage! 7. Keep the countertops free of stuff. Other than the canisters I kept the counter relatively clear. I knew if I tried to style it with a lot of stuff it would just end up getting in the way. 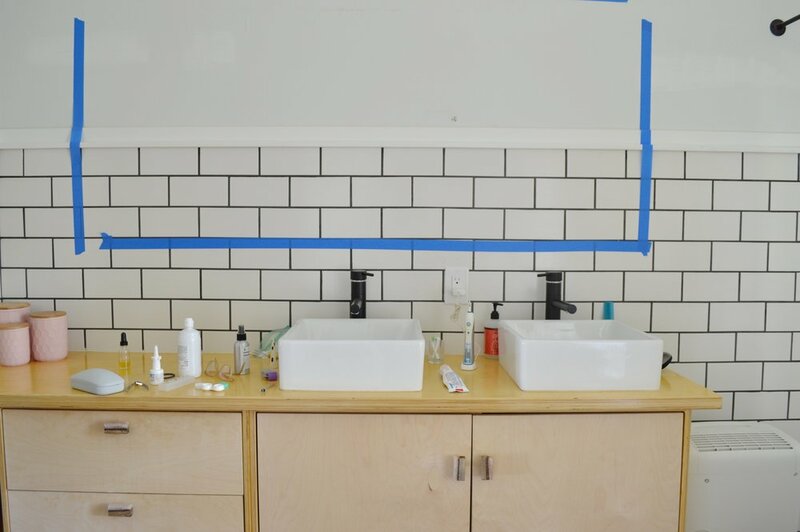 The counter space in a bathroom is one that gets used really frequently and while it may seem a little bare I know we’ll end up with less clutter in the end if I don’t style it with a bunch of unnecessary objects. Pin this and save it for you next organization project!